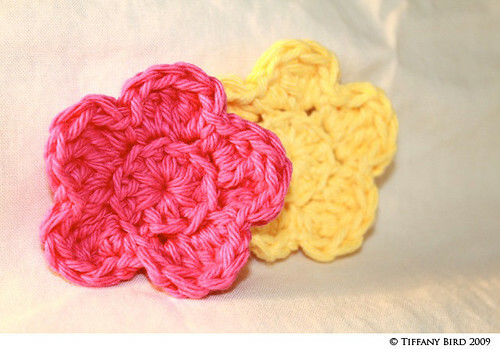 Here are the instructions to make the crochet pansy if you missed out on the giveaway. If you make something using this tutorial, please upload pictures of it in our Flickr group to show it off to everyone. You may be featured on Simply Modern Mom. Rnd 2: ** sc and 2 tr in the first st, then 2 tr and sc in the next st ** repeat ** 4 more times. Sl st and fasten off. 5 petals. At first, your petals will be a bit scrunched, just flatten out with fingers. Yup, it’s that easy. Adorn the flower with buttons, sequins, beads, whatever you can find around the house. Put it on a clip, headband, pin, or sew it onto a purse or shirt. Oh these are so cute, nice job! Mmmm… a project to add to my next set of INSPIRING FREE CROCHET PATTERNS. I am TOTALLY in love with my first set of 7-8 free crochet patterns that are … just stunning! I made this list (and it took ALL DAY) for a friend and I thought to offer all the patterns to my readers. If you are interested, check them out. Too cute! I can just imagine these in a little girl’s hair :). I saw where Antropologie had oodles of scarves with posies on them… we are in business. guess what everyone gets for Christmas? I love this pattern. Thank you for sharing! Would you mind sharing the star lily pattern as well? I’d love to try it. I came across this pattern for the Crochet Pansy Flowers and think they’re adorable! I am one of the editors for AllFreeCrochet.com and would love to feature your tutorial on my site with full credit to you. I know my readers would just love it and in return would generate some nice traffic to your site. If you agree and would like us to feature your project, our readers will simply click the link to your blog to get your full tutorial. It’s really that simple. I couldn’t help but notice you have plenty of other great crochet patterns as well that would be a great addition to our site, as well! I look forward to hearing from you soon. Thanks! !